In late 2018, I met Nicolas Bouché as he was touring the region to present his cuvées. After having tried a few from his rich selection, I chose to buy a bottle of his Cuvée Saphir, a rich blend composed mostly of Chardonnay aged 10-years from the house’s oldest vines. Download the Bouché Cuvée Saphir Champagne Sheet as a PDF. Founded in 1920 by Abel Bouché, the house began by selling grapes from a hectare of family-owned land. Shortly after the Second World War, Abel’s son, Pierre, started blending and ageing the grapes himself to sell Champagne directly. This allowed for the third generation comprising of José and Astrid to expand and develop the house’s infrastructure, which now consists of over 30 hectares. Today, the house is run by Nicolas and Stéphanie, the fourth generation of the Bouché family, with José’s continued support. Serving a glass of Cuvée Sphir reveals a creamy mid-gold Champagne with its transparent robe. The contents of the glass have a thick and syrupy texture with delicately small perlage that gracefully rises to the surface. A rich and complex bouquet, Cuvée Saphir projects complex and lucid notes. While they were fewer in number, they were vivid and concentrated. A first nose revealed fresh peaches with a combination of lemon zest and sweet cream, which was evocative of lemon meringue. Meanwhile, a second nose would help to discover Cuvée Saphir’s deeper notes of thick honey and yeasty toasted brioche. Aged on lees for a period of 10 years, Bouché offers a vinous palate of mature flavour. Furthermore, the use of old vines provides that extra level of maturity with a drying, velvety texture. Interestingly, this creates a unique duality with the characteristically zesty and mineral marjoritively Chardonnay composition. Opening with zesty lemons, mirabelle plum soon follows along with the slightly metallic taste of tinned apricots. As the flavour develops on the palate, I couldn’t help but compare the dry yet sweet citrus notes with gummy bears while a warm syrupy touch of honey frothed on the sides of the tongue. As the experience came to a close, the finish was dominated by the same toasted brioche experienced in the nose before leaving a crisp trail of chalk mineral. Given its complex, mature and overall unctuous palate, the Cuvée Saphir is not a Champagne to pair with any meal. In fact, it demandes refinement in order to be fully enjoyed. I actually kept this bottle aside to enjoy with the family Christmas dinner so it would accompany the entrée of foie gras as recommended to me by Nicolas himself. Making sure that the foie gras had just warmed up enough while the Champagne was served at 10°C (50°F), I was not disappointed! Generally, I’d say that this is a Champagne that bests suits either the starter or cheese course. Being quite dry, I wouldn’t recommend it for dessert whilst it may be challenging to pair with the main. Instead, consider marrying it with foie gras as suggested above or even oysters or caviar. Alternatively, it would make a pleasant accompaniment for hard cheeses such as a mature conté or simply a well-made farmer’s brie. Bouché’s Champagne’s feature an understated label somewhat reminiscent of Krug. A small, rounded rectangle sits near the base while a larger golden “B” rests above it. Each cuvée’s label is a slightly different colour and the bottle itself is transparent to show off the Champagne’s rich robe. Unfortunately, I misplaced the plaque shortly after unbottling the Champagne, which is quite embarrassing! Therefore, I wasn’t able to take a good look and provide my opinion to it. Nevertheless, I recall the cork being in great condition and regaining its shape relatively quickly. In terms of value for money, Bouché’s cuvées are very reasonably priced. I picked up the Cuvée Saphir was around 30€, which translates to more-or-less $40. Finally, this is a grand Champagne despite the generous price tag. Therefore, this is one that could be perfectly justified for enjoying alone or with friends. 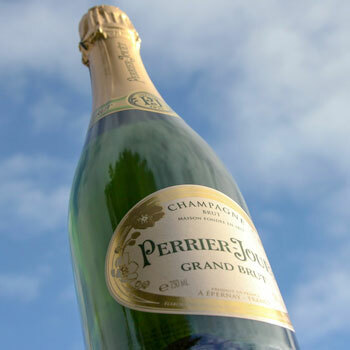 Nevertheless, it’s also a very refined Champagne ideal for more prestigious events. However, I’d suggest reserving it for dinners rather than parties as it is not something to quaff but to appreciate slowly. If you’re looking for a mature and relatively complex Champagne but have a restricted budget, Bouché would be an excellent choice indeed. Their affordable range of high-quality blends are as varied as they are rich in flavour. Unfortunately, the house doesn’t yet have a supplier in the USA. Therefore, Bouché would have to be a house to visit if you’re ever in the neighbourhood. Having met Nicolas myself, I would recommend paying them a visit for a warm welcome and the opportunity to taste their selection. Reviewed by Charles-Philippe, on 9th January . "Vinous yet mineral duality. Aged for 10-years, this affordable Chardonnay-heavy blend features a richly unctuous palate while showcasing the zesty mineral palate of Champagne's white grape."